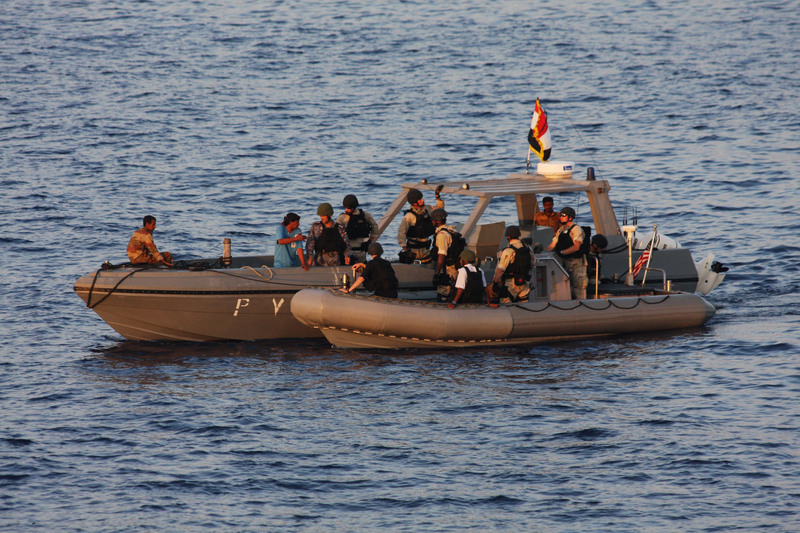 Eight Yemeni navy personnel, in two small boats, sailed from Socotra Island, in theArabian Gulf, to Abd Kori Island, 85 nm west of Socotra, before running into difficulties, Mar16. USS Halsey, locates and assists Yemeni mariners adrift in the Arabian Gulf for 65 hours. Due to harsh weather and poor visibility, the mariners drifted off course and eventually ran out of fuel. At about 10:00 am, local time, March 16, radio contact was lost with ground stations on Socotra Island. Following an official request from authorities in Yemen to Combined Maritime Forces (CMF), USS Halsey, conducting counter-piracy operations in the area, was directed to commence a search and rescue (SAR) operation. Fortunately, one of the small boats was able to re-establish radio contact with a ground station on Socotra. They reported that they had drifted for over 100nm, south east of their expected position. This updated information was passed to the CMF staff onboard Halsey, which proceeded to the location, about 42 nm south of Socotra, arriving late Sunday afternoon. Although mentally and physically fatigued, having drifted at sea for over 65 hours, all eight mainers were safe and uninjured. With the mariners onboard, USS Halsey transited back towards the Socotra coastline to transfer the mariners to the Yemeni Navy, early Monday morning. Major General Rowais Mujjawar, Commander of Yemen Navy Forces & Coastal Defense, has commended the efforts of CMF and Combined Task Force 151 embarked on Halsey, for their persistence in searching and returning the mariners safely to land. Command Nasser Al-Kahtani, the Yemeni Navy Liaison Officer to CMF, conveyed his highest appreciation and gratitude to CMF staff for their help and support. CMF is a multi-national naval partnership, which exists to promote security, stability and prosperity across approximately 2.5 million square miles of international waters in the Middle East.